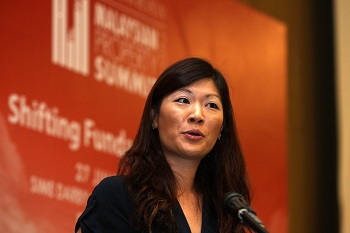 Kenanga Investment Bank Bhd head of equity research Sarah Lim (pictured) believes the current Malaysian property market down cycle could last longer than usual due to liquidity-driven factors. “The property market is going through a structural change as key property market drivers are also experiencing structural changes,” said Lim during Malaysian Property Summit Mid-Year Review 2016 today. TheEdgeProperty.com and The Edge Malaysia are the media partners of this event. She explained that those key property market drivers are the number of typical first-time home buyers, which has already peaked and is likely to decline; the banking system, which is still curbing liquidity to the property market; and structural issues regarding the mismatch of supply and demand because of affordability issues. She also foresees that Malaysia Residential Transacted Values (MRTV) — which reflects property prices — will decline slightly by 2% year-on-year, despite sales increasing marginally by 1% in the same period. “We are expecting a more flattish U-shaped down cycle because tightening property measures have already helped the market cool off, resulting in greater prudence amongst developers, bank and property buyers,” Lim said. She also said that the issue is not the interest rate but the lending liquidity. Bank Negara Malaysia will need to address lending practices such as loan assessment methods, loan-to-ratio caps, and valuation of properties, to ease the lending liquidity. She also said the lack of affordable projects in urban areas also contributed to the flattish U-shaped down cycle. “Demand is strongest for residential in urban areas priced at RM250,000 to RM500,000, but we didn’t see many such projects offering in the market,” she said. She concluded that house buyers and developers will have to do more homework when buying or selling homes as a union of choice locations, price points and concepts becomes even more critical in challenging times.